December 15, 2015 By Debra Schroeder 23 Comments This post may contain affiliate links. Traveling Well For Less has partnered with CardRatings for our coverage of credit card products. Traveling Well For Less and CardRatings may receive a commission from card issuers. Opinions, reviews, analyses & recommendations are the author's alone, and have not been reviewed, endorsed or approved by any of these entities. Read my disclosure policies. White haired senior citizens gingerly walking through the grounds, hands clasped tight to the arms of their walkers. Leaves gathering on empty tennis courts as their sagged nets sway in the breeze. You might see those things at other rv parks. But you won’t see them at Golden Village Palms RV Resort. Disclosure: My stay at Golden Village Palms RV Resort was provided courtesy of Visit San Jacinto Valley for the #VisitSJV Blogger Press Trip. All opinions are 100% mine. That’s right, RV resort in the San Jacinto Valley. Golden Village Palms RV Resort is a resort, not an RV park. And general manager, Michael Carle, won’t let you forget it. 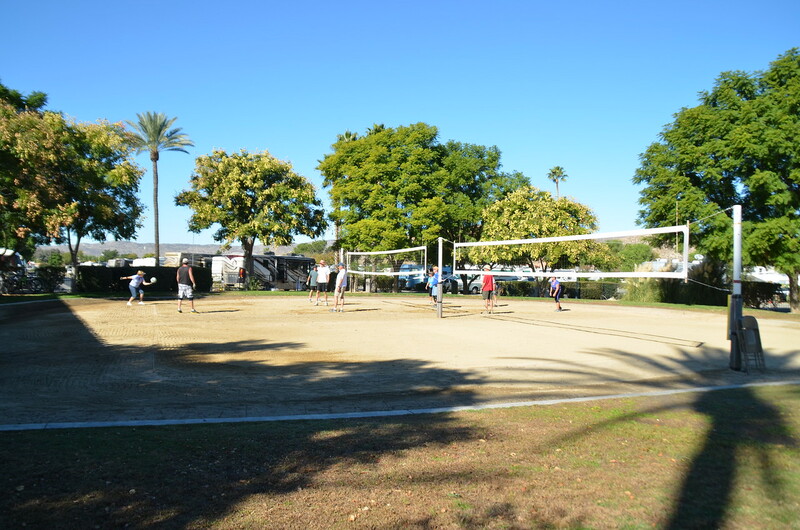 Golden Village Palms RV Resort offers countless activities and events such as bingo, line dancing, and volleyball. 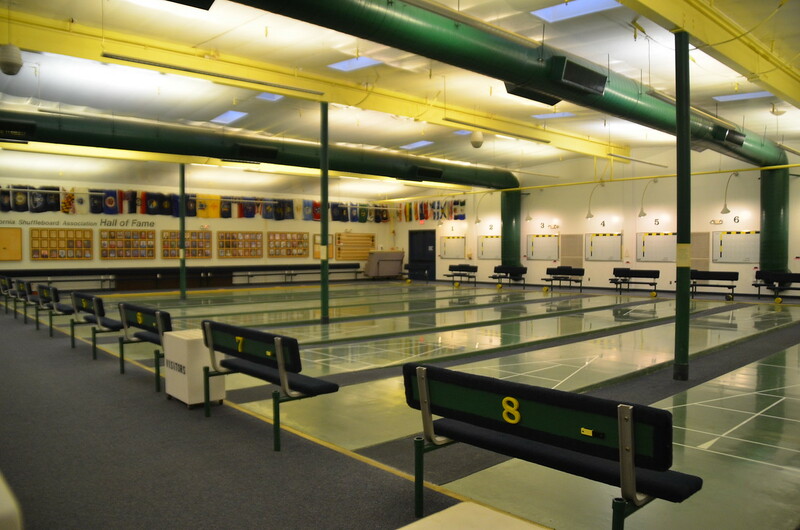 And if you’re a shuffleboard fan, you’re love their indoor shuffleboard court. And for the more adventurous, there’s Zumba, belly dancing, and water aerobics. What do you do when tennis elbow leaves you feeling 0 love? You take up pickle ball. 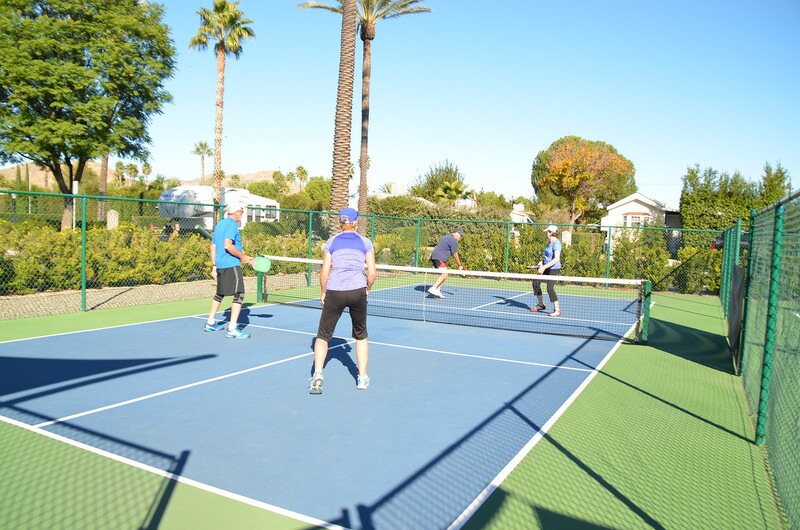 Pickle ball is played with paddles and a whiffle ball and despite the name, can be a friendly yet competitive game. Once I got the hang of the game, it was a lot of fun. Stay tuned for a separate blog post about my experiences playing pickle ball. 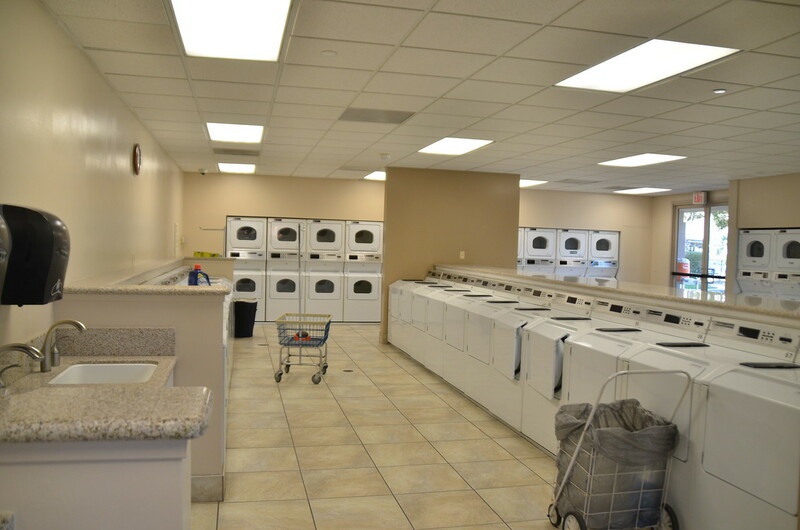 Resort amenities include a spacious laundry room with 36 front loading washers and dryers. Golden Village Palms RV Resorts also offers a concert series open to the public featuring tribute bands such as The Bee Gees, Shania Twain & Tim McGraw, Jimmy Buffet, ABBAFAB, and Fortunate Son. There’s even daily Happy Hour and a beer cart! There’s plenty to see and do outside of the resort such as outdoor activities and unique museums. You can find all the details in my post Frugal Travel Secrets and Hidden Gems of the San Jacinto Valley. No you don’t need to have an AARP membership to stay at the Golden Village Palms RV Resort. But you do have to be at least 18 years old. That’s because the guests want to be able to cut loose and enjoy themselves without having to be grandma or grandpa all the time. But at Golden Village Palms RV Resort, you can either bring your RV and hook up to one of 1,019 sites. Each site offers concrete patios and complete hookups for water, electricity, cable TV, sewage, and Wi-Fi. Some spots can accommodate RVs up to 70 feet. Phone service is available for extended stay guests. Or you can stay in one of the resort cottages (where I stayed during my visit) or a two-bedroom VIP condo. 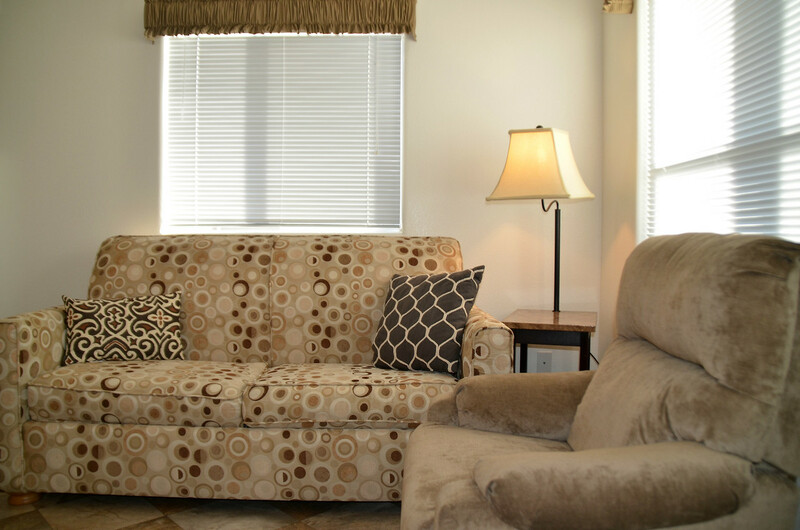 Stay in a resort cottage at Golden Village Palms RV Resort for a home away from home experience. 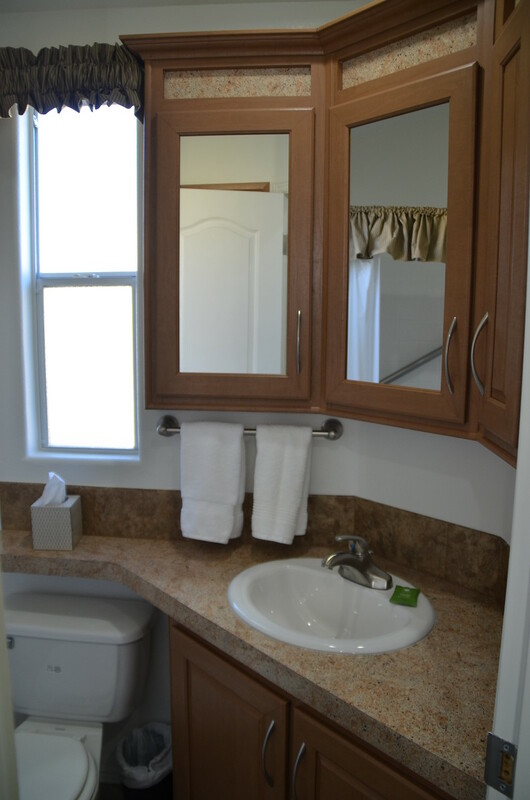 You get all the amenities of home combined with the luxuries of a resort hotel when you stay in a resort cottage at the Golden Village Palms RV Resort. 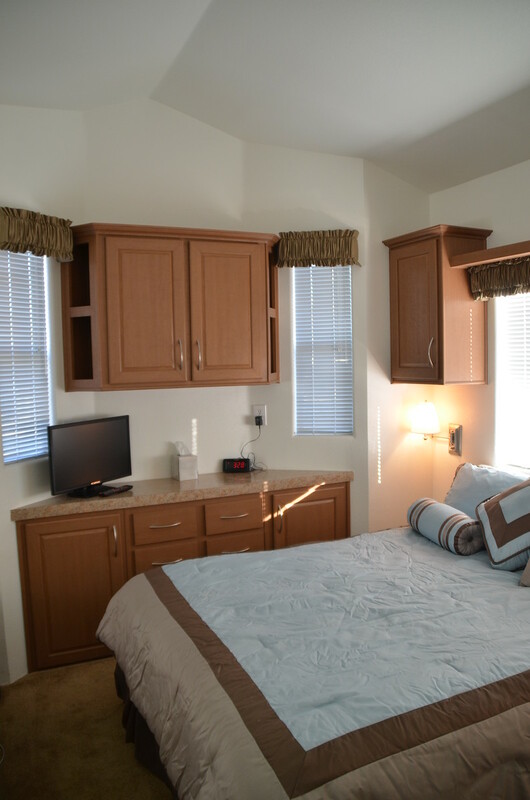 The cottages are a great option for family and friends visiting extended stay RV guests. Two can sleep comfortably on the queen sized bed in the bedroom. And there’s a sofa bed in the living room. There was a two person sofa bed and a suede recliner in the living room. The recliner was dangerously comfortable. You take a seat and the next thing you know, you’re out like a light. Although we ate out, you can save money cooking in the cottage’s full kitchen. 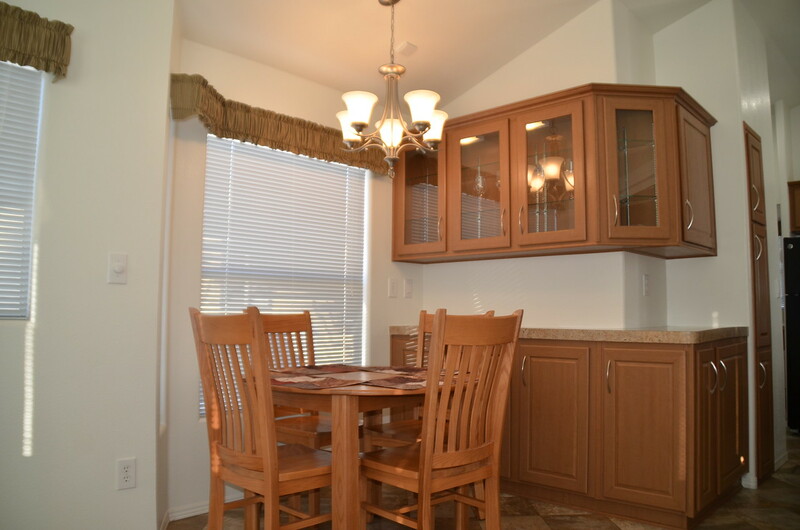 You’ll find a complete set of dishes, silverware, baking and cooking pots and pans. There’s even a toaster, tea kettle, and coffee maker. The only thing you have to buy is the food and spices. 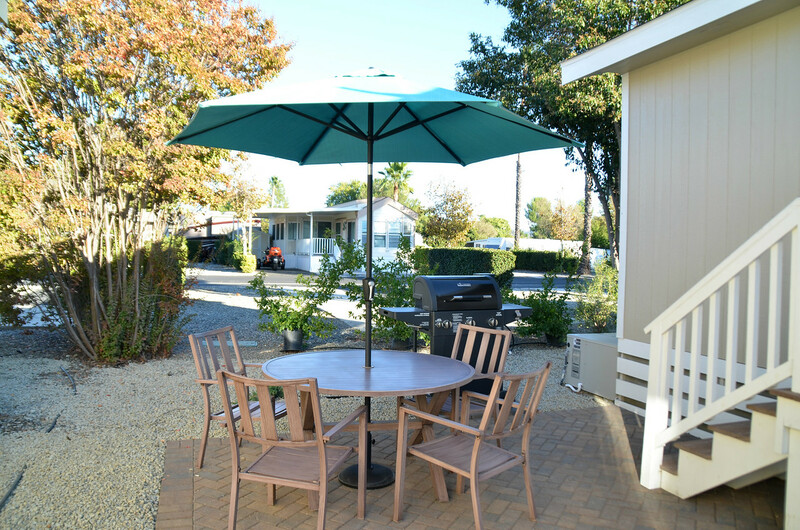 Here’s a complete list of what you’ll find in each Golden Village Palms RV Resort cottage. I used the dining table as a desk. Plus it was right across from the living room TV. Since we cancelled cable over the summer I needed to get my fix of bad reality TV. The bathrooms are smaller than a hotel bathroom. But there’s no wasted space. 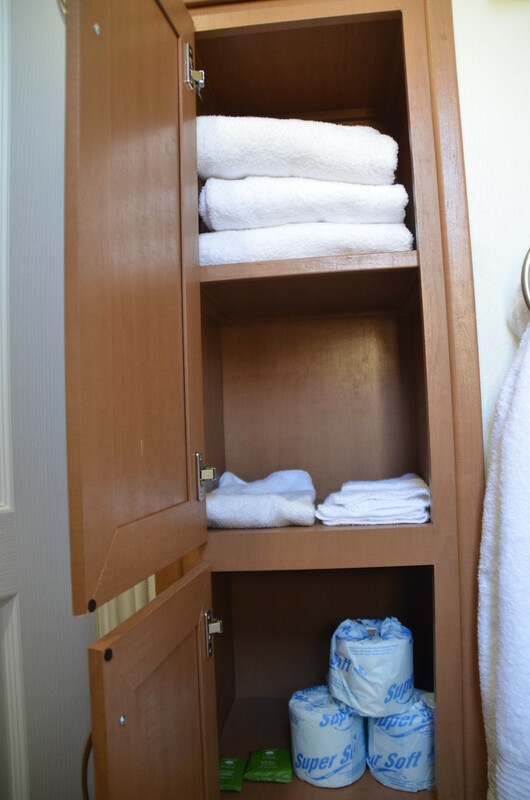 The bathroom includes a built-in linen closet with extra towels, soap, and toilet paper. 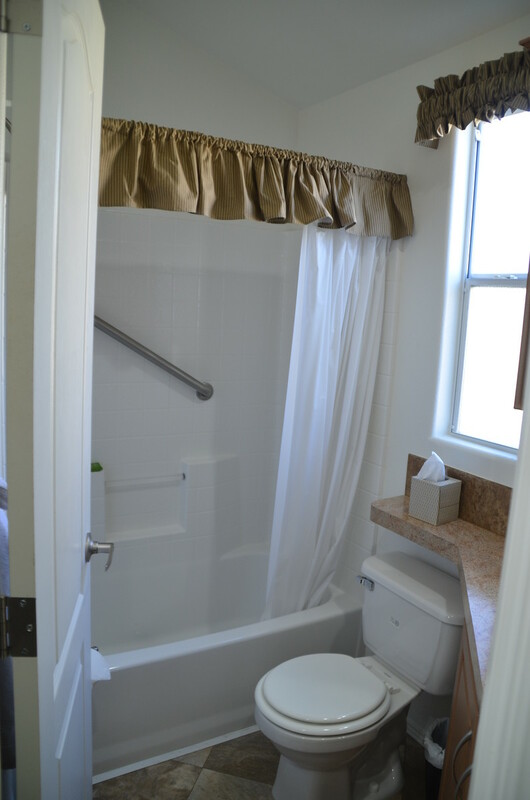 Although the tub and shower are narrow, I appreciated having the option to shower or take a bath. Many hotel bathrooms only provide a shower. And after a long day walking around a city, sometimes you want to soak in the tub. There was a flat-screen TV, digital alarm clock, and lots of cabinets in the bedroom. I loved all the natural light from the two narrow side windows and the larger window directly behind the bed. And the bed. So comfortable! 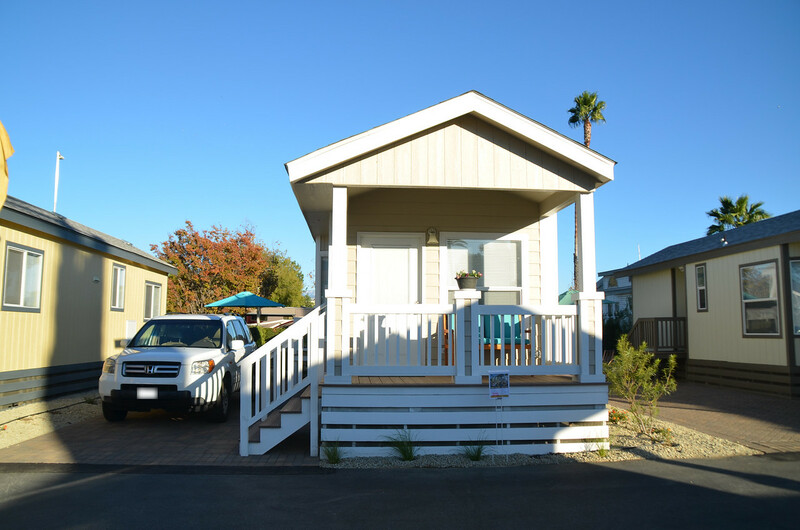 It was like a Westin Heavenly Bed and a Hyatt Grand Bed had a baby and the result was the bed at the cottages at the Golden Village Palms RV Resort. I could have lounged in that bed all day, it was that cozy. The living space extends outdoors with a backyard patio and BBQ. It gets really hot in Hemet during the summer so the BBQ is a necessity. 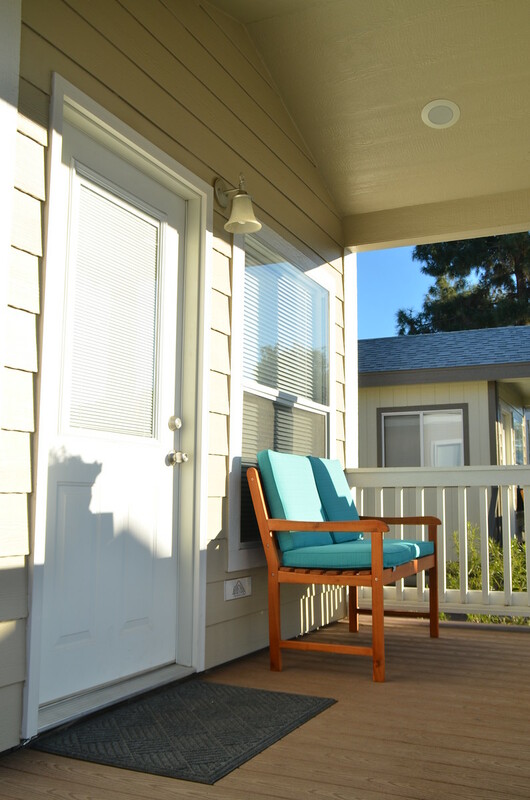 The front porch encourages a sense of community and lets you get to know the other cottage guests without being thrown into an awkward situation. 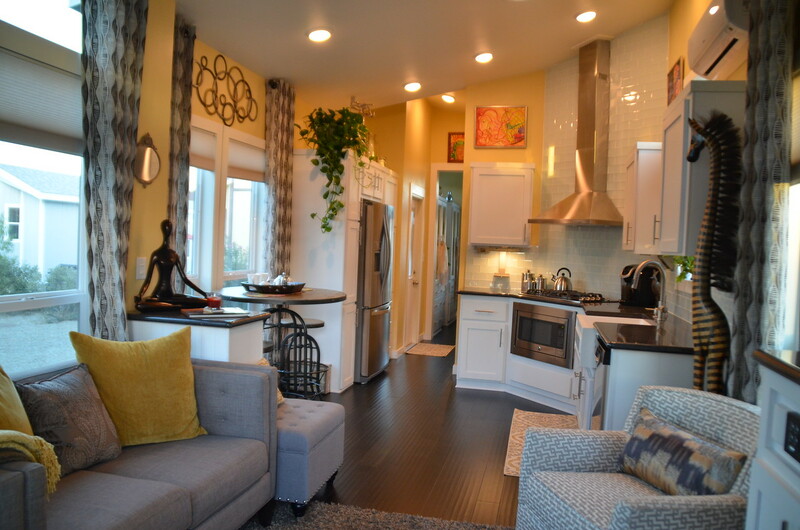 The cottages are also a great introduction for someone who’s wants to try living in a tiny house. 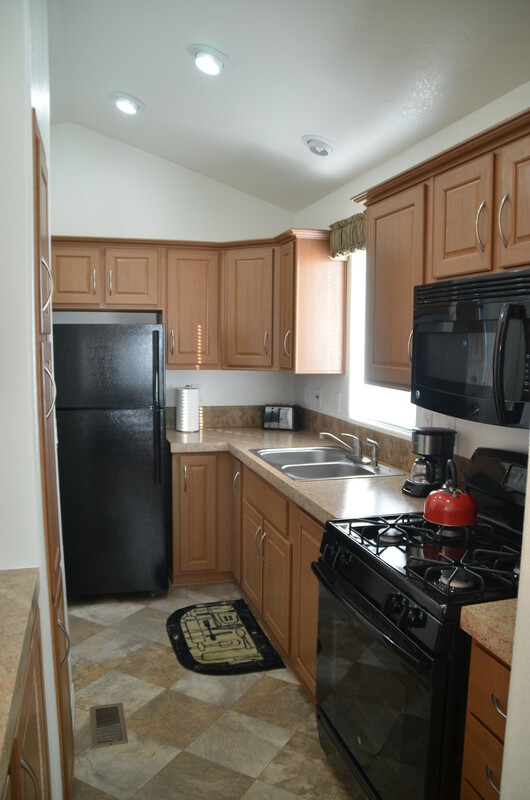 You can rent a cottage at Golden Village Palms RV Resort while keeping your existing home. When buying a cottage, you can customize the design to reflect your personality. 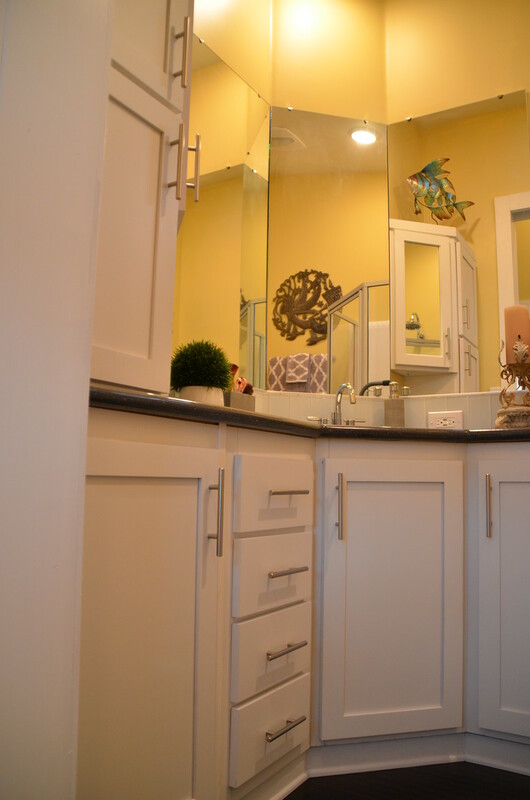 Bathrooms in a tiny home can be designed to fit your needs. 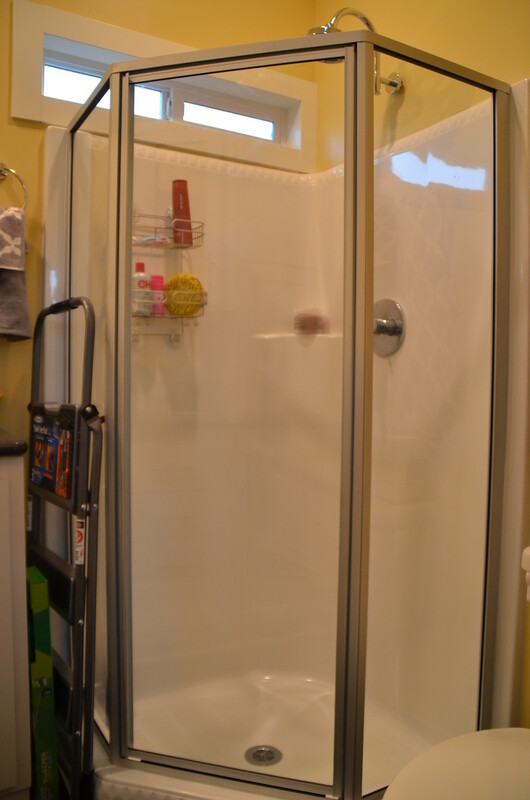 The owner of this tiny house wanted more living area so she went with a smaller bathroom with only a shower. This tiny house was designed to fit a queen bed. A king bed will fit, but you won’t have as much room to walk around the bed. The Wi-Fi. Oh (big sigh) the Wi-Fi. It’s there and it’s fast, but you’re limited. Talk about throttling! You get 75 MB of data a day for free. And this is calculated on a 24-hour clock. So basically, a couple of websites and boom! The hammer drops and it’s time to pay up. You pay $4.95 a day for additional data over the free 75 MB allowance. Which can add up if you’re staying awhile. Let’s assume you’re staying for a week, being able to tweet, surf the net, play on Facebook, or should I say it…work will cost you $34.65. Which isn’t a lot in the grand scheme of things. But every little extra charge adds up. And it’s not that fast and can get bogged down. Now if you’re staying for an extended period of time, like a month, you’ll pay $148.50. Yikes! Don’t get me wrong, I really liked staying at the Golden Village Palms RV Resort, but I love my techie toys and I NEED my internet. 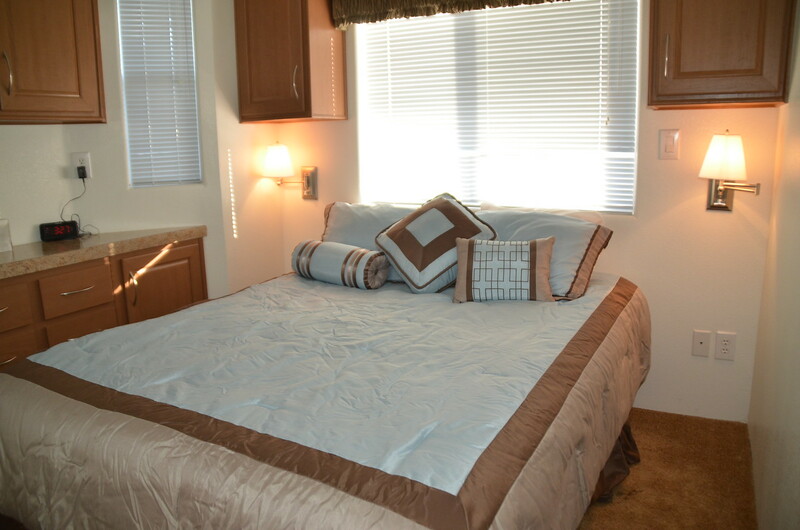 Golden Village Palms RV Resort is unlike any other RV experience. It’s perfect for someone who wants to vacation their way: having the creature comforts of home with the luxury and amenities of a hotel resort, whether you stay in your RV or rent a cottage. 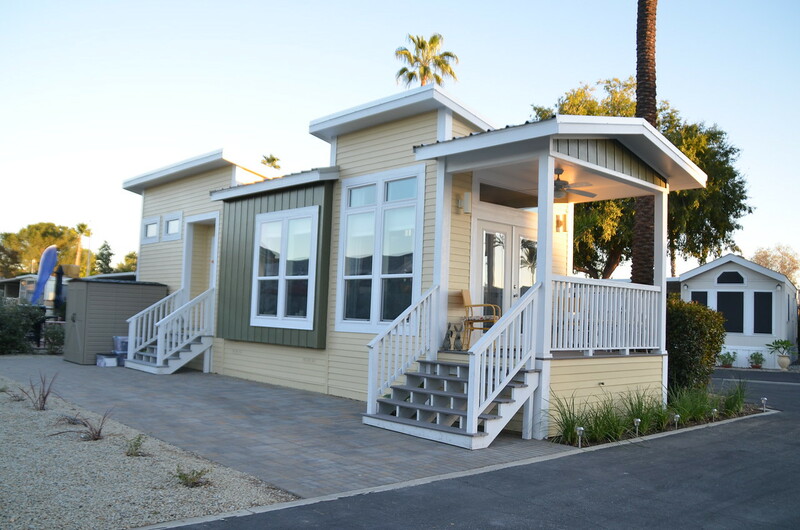 The cottages at Golden Village Palms RV Resort is a great introduction to the tiny home movement. Because many tiny houses are the same size as the cottages, you can rent a cottage for several months to see if a tiny home is right for you. 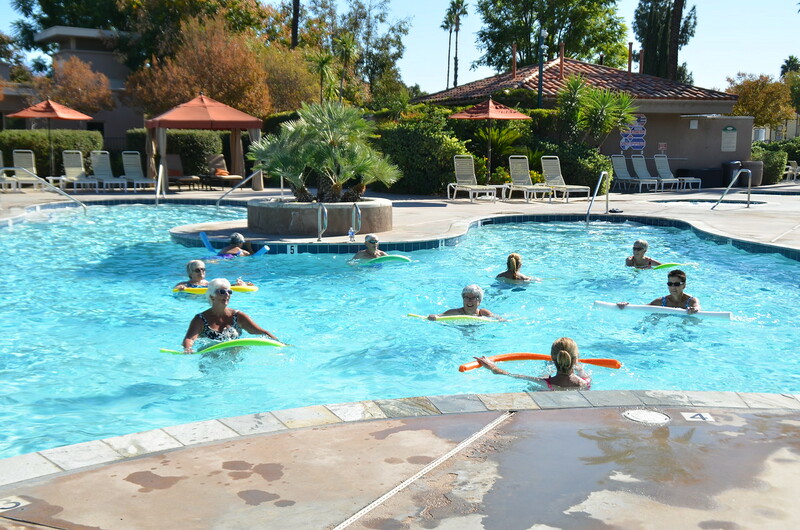 From a pickleball tournament to learning how to play shuffleboard to singing with the Bee Gees, a stay at the Golden Village Palms RV Resort is like the movie, “Cocoon,” in real life. Okay, maybe I’m exaggerating a bit. But staying at the Golden Village Palms RV Resort was a pleasant surprise and entirely nothing like I had expected. And it’ll surprise and please you. What are your favorite RV resorts? So cool! I didn’t even realize there were places like this for RVs. And pretty awesome that you can stay even if you don’t have an RV. Of course it’s off limits to us because we travel with a 5 year old, but good to know for our future days of roadtripping when our son is grown! It’s pretty impressive. I hear ya, my kids are still both under 18 so I went solo. I wish they would let kids stay, it would bring in more business. Children can stay up to 2 weeks at a time, and are aloud in the main pool area. We are feared towards the active adult though!Please let us know if you wish to come visit and check it out. Wow! Just by looking at the pictures, I was about to book a trip! Such a great location focused on the community.. The way it should be! I can’t imagine an RV Park looking anything like this one. They offer so many activities, and entertainment to make the guest not want to leave. It looks like a great place to stay if your traveling cross country and need a place to stay to relax for a few days before continue your journey. RV parks have come a long way. Too bad they don’t all like Golden Village Palms RV Resorts. It was great staying for a few days, I could also see staying for longer. It’s great for snowbirds. Say what?! An RV resort? I’ve never considered something like this before, but it looks like a cool alternative to hotels when traveling. I also love that this one is 18+. Great post! Wow, this is so nice! You literally wouldn’t have to leave, everything is right there. Great review! Thanks. 🙂 Too true, you only have to leave to buy groceries. And even then, the store is literally down the street. My husband and I have been renting cottages and guest houses on trips lately, because we like having a kitchen available. This is perfect for us! Awesome, so glad this post helped. I’d love to hear if you end up staying there. Give me a call, I would love to set you up in a cottage and show you around. Where do you sign up? I’m in! 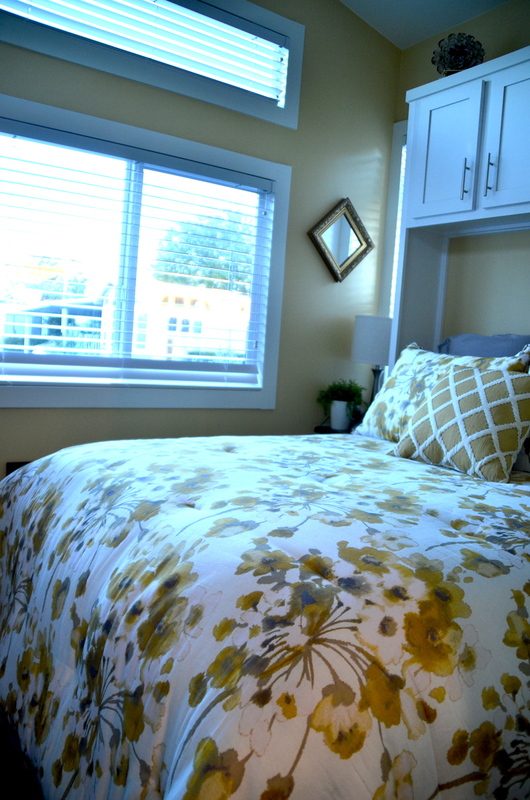 What a great way to experience small living and the RV park lifestyle. LOL, You can book online or call Golden Village Palms. Give me a ring directly, I will hook you up!!! The eco-cottage is SO nice! I would love this! You can stay there even if you don’t have an RV. I stayed in one of the cottages.